Diamond earrings and fine gems from DiamondsHere.com and NO Sales Tax. 0.10CT TW PREMIUM round brilliant cut diamond studs of G-H Color, SI1 Clarity. Mounted in our solid four prong studs with tension backs for a secure fit. Choose 14K Yellow or White Gold, all earrings from DiamondsHere are delivered in a plush box. Call 1-800-279-4337 today! 0.23CT TW IDEAL round brilliant cut diamond studs of H Color, SI1 Clarity. Mounted in 14K white gold. We select our diamonds to make a perfect matched pair and sell our diamond stud earrings by EXACT DIAMOND CARAT WEIGHT! 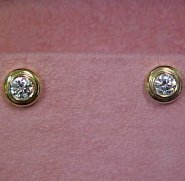 Check out our large selection of diamond studs...we have them in many sizes, cuts, clarities and colors! Give us a call - we probably have it in stock or can find it for you! 0.49CT TW IDEAL cut round diamond studs of H Color, SI2 Clarity. DiamondsHere offers our FINE QUALITY and our popular TOP OF THE LINE QUALITY! Mounted in our solid 14K yellow gold four prong studs. All earrings from DiamondsHere are delivered in a plush box. Call 1-800-279-4337 today! 1.24CT TW IDEAL cut round diamond studs of G-H Color, SI1 Clarity. DiamondsHere offers our FINE QUALITY and our popular TOP OF THE LINE QUALITY! Mounted in our solid 14K white gold four prong studs. All earrings from DiamondsHere are delivered in a plush box. Call 1-800-279-4337 today! 1.09CT TW of G Color, SI1 Clarity, IDEAL cut diamond earrings. We select our diamonds to make a perfect matched pair and sell our diamond stud earrings by EXACT DIAMOND CARAT WEIGHT! 1.34CT TW PREMIUM cut round diamond studs of H Color, SI1 Clarity. DiamondsHere offers our FINE QUALITY and our popular TOP OF THE LINE QUALITY! Mounted in our solid 14K yellow gold four prong studs. All earrings from DiamondsHere are delivered in a plush box. Call 1-800-279-4337 today! 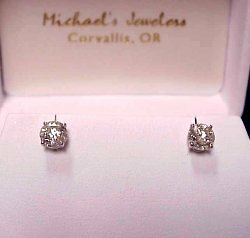 Celebrate your anniversary with this stunning 2.01CT TW pair of diamond stud earrings! These are the round cut, H Color, SI1 Clarity set in our 14KW gold moutings. This is fine jewelry she will treasure forever. DiamondsHere offers our FINE QUALITY and our popular TOP OF THE LINE QUALITY! Mounted in our solid 14K yellow gold four prong studs. All earrings from DiamondsHere are delivered in a plush box. Call 1-800-279-4337 today! 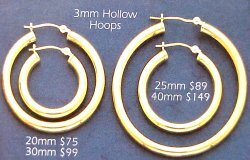 Our popular 3mm hollow hoops are made from our best weight 14K gold and finished to a rich satin luster that will accent your beauty for ever! Each comes with our secure 14K safety catch to provide you with no worries wear. Lovely 1.36CT TW Diamond Studs! 1.36CT TW IDEAL round brilliant cut diamond studs of G Color, SI1 Clarity. DiamondsHere offers our FINE QUALITY and our popular TOP OF THE LINE QUALITY! 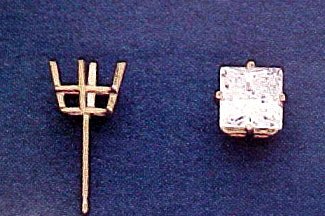 Your choice of 14K White or Yellow gold mountings! Shipped in our pink plush box and gift wrapped! DiamondsHere offers our FINE QUALITY and our popular TOP OF THE LINE QUALITY! Mounted in our solid four prong studs. Choose 14K Yellow or White Gold. All earrings from DiamondsHere are delivered in a plush box. Call 1-800-279-4337 today!